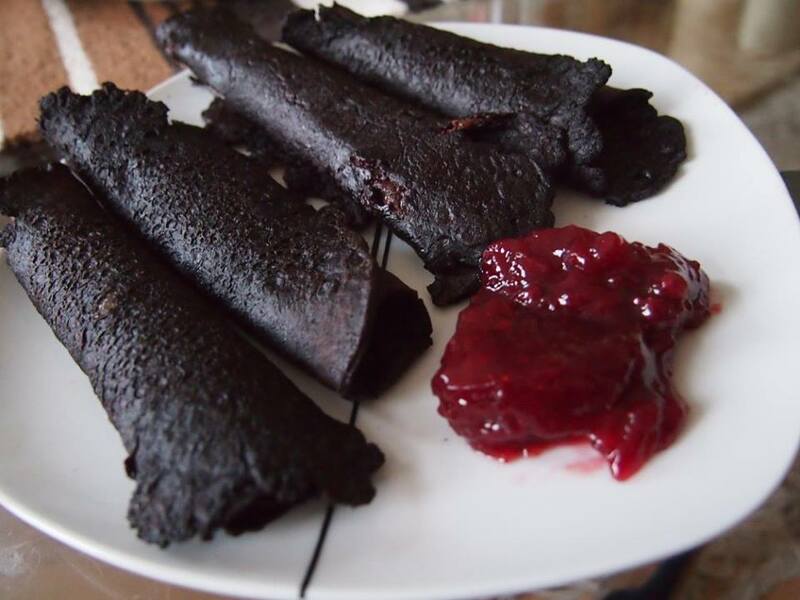 Veriletut (blood pancakes) are a traditional dish mostly known in Finland and Sweden, in older times often served after slaughtering days, in order not to waste anything of the cattle. They are similar to black pudding, but are thinner and crispier. Because they are high in iron, blood pancakes are recommended against anaemia. I received the recipe from my Finnish grandmother several years ago. Sift and stir the blood. Cube and fry the onion. In a large mixing bowl, whisk together the flour and the egg. Add in the beer and the blood, stirring to combine. Add the fried and cubed onion, salt, marjoran and butter; beat until smooth. Heat a frying pan over medium high heat. Melt a bit of butter, scoop the batter onto the pan, using approximately 2/3 of a ladle for each crepe. Cook the pancake for approx. 2 minutes, until the bottom is well done. Turn the pancake and cook the other side. Serve hot, either with butter and fried onions, or with cranberry jam.